Today, mattress shoppers are offered a seemingly endless number of choices. One question that often comes to mind when deciding on a mattress is “What makes this one different?”. After all, most mattresses-in-a-box are simply 3-4 layers of foam glued together with a cover stretched over top. In the end, it comes down to the design and quality of materials that are used. In 2018, Chicago-based mattress company Molecule was launched, differentiating itself by offering a mattress that enhances sleep quality. Their marketing seems to be geared towards those who live an active lifestyle and are interested in improving sleep in order to enhance daytime performance. They claim to have developed an “Air-Engineered” mattress which has been designed to maximize support and comfort while offering superior cooling qualities. All of this to promote the best recovery sleep ever. But is Molecule as cool and comfortable as they claim? Is it really any different? Does it really improve performance? Follow along as I put the Molecule mattress to the test and answer these questions as well as several others. I’ll closely examine the components of the Molecule and put it through a series of tests to show you what this mattress is made of. I’ll also spend several nights on this mattress and offer my personal opinion on how it sleeps. My queen size Molecule mattress shipped from Auburn, Indiana via FedEx. The total transit time was only 3 days. The Molecule arrived in a 19″ X 19″ X 42″ box and weighed about 79lbs. After removing it from the box, I recruited my wife to help me carry the mattress upstairs. I found that carrying the mattress is definitely a two-person job if you want to avoid pulling your back out. The process of unpacking the Molecule mattress was identical to all other mattresses-in-a-box that I’ve tried. They did provide a letter opener which helped to unwrap the mattress without cutting the material. I laid the molecule out on my existing wood slat bed frame and cut along the flat seam of the mattress. Nearly instantly, the mattress expanded like an opened can of biscuits. While the mattress was ready to use almost immediately, I waited until the next night to give it a little extra time to expand. Start-to-finish, the Molecule mattress took less than 10 minutes to set up. Some foam mattresses give off a smell that can be really irritating. This smell comes from off-gassing which is caused by the release of Volatile Organic Compounds (VOCs) that emit from freshly made foam. Think of it as the “new car” smell. VOCs are found in most manufactured goods at some level. High levels of VOCs will not only irritate the airway but may also be harmful to your health. Molecule is CertiPUR-US certified and one thing they check for is VOCs emissions. In order to become certified, VOC levels must test at less than 0.5 parts per million. In addition to being CertiPUR-US certified, the foam used in the Molecule is made using Variable Pressure Foaming (VPF). This eco-friendly manufacturing process occurs in an air-tight controlled environment. The air is scrubbed through a charcoal filter which eliminates most off-gassing in the final product. Knowing that this mattress is CertiPUR-US certified and made using VPF, I felt fairly confident that it would not produce any strong odors. After opening, I placed my face down into the mattress and took a deep breath. The mattress had a very faint smell that was not at all offensive and disappeared after a day. The smell was likely caused by the non-toxic water-based adhesive that Molecule uses to glue together the slabs of foam. 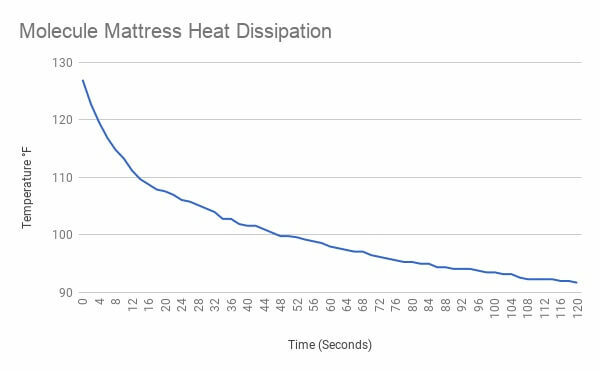 Molecule seems to have put a lot of effort into designing an “air-engineered” mattress, so I was curious to learn exactly how well this mattress performed when heated up. Some foam mattresses are known to retain heat. In recent years, foam mattress manufacturers have come up with some clever ways to combat this issue. Molecule is topped with a proprietary open-cell foam that is said to provide consistent cooling, even when compressed by body weight. The polyester/ elastane blended cover also helps by wicking moisture away from the mattress, keeping your body cool and dry. 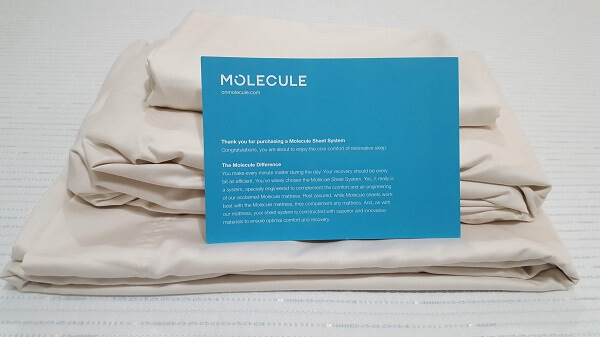 In addition, Molecule also offers a sheet set that’s specifically designed to keep your bed cool and dry. Before sleeping on the bed, I performed a heat dissipation test to give you an idea of how cool this mattress sleeps. Heat a 3lb rice sack in the microwave for two minutes and placed it on top of the mattress, leaving it to rest for 10 minutes. Using a heat gun and stopwatch, I tracked the heat loss over a two minute period. Take a look at the temperature drop in the chart below. As you can see, the mattress cooled rapidly, dropping a total of 35.3 degrees in 2 minutes. The majority of heat loss occurred during the first 20 seconds and slowly tapered off from there. When sleeping on the Molecule mattress with the molecule sheets, the bed remained cool, dry, and comfortable throughout the night. The firmness of a mattress refers to how soft or hard a mattress feels. Measuring the feel of a mattress can be subjective and will differ from one person to another. Firmness is often expressed as a number on a 1-10 scale. Manufacturers will assign a number along with a description such as “very soft” which describes a mattress rated at a 1 to “very hard” which would describe a mattress that’s rated at a 10. Molecule describes this mattress as a “medium firm” or a 6.5. In order to give you an idea of the firmness level of this mattress, I performed a simple test involving a concrete-filled bucket, ruler, and straightedge. For this test, I simply fastened a ruler to the side of a 42lb bucket and used a straightedge to determine how far the bucket dropped down. The test showed that the mattress dropped 2.5″ which is consistent with other medium-firm mattresses that I’ve tested. When laying on the mattress, it felt more soft than firm. I would actually rate the firmness of this mattress somewhere around a 5. Support is one characteristic that many people fail to consider when shopping for a mattress. While it’s easy to confuse firmness with support, these are actually two entirely different characteristics. Firmness relates to the comfort of a mattress while support refers to how well the mattress relieves pressure and keeps your body aligned. A mattress can be firm yet provide no support while at the same time a very soft mattress can provide proper support. How well a mattress supports your body depends greatly on your body type and size. When sleeping on the Molecule, I work up without any aching or joint pain, which is an indicator that the mattress provided proper support. I asked my wife to observe me laying on the bed to see if my body was aligned. I was told that my body remained straight with no bending while laying on both my back and side. Remember, I’m 6’1 and 215 lbs. Your results may vary depending on your body size and type. Recovery time refers to how quickly the mattress bounces back after weight is removed. When weight is applied to a foam mattress, the foam is going to compress. The question is, how long does it take to recover? A mattress with a long recovery period may leave you feeling stuck inside the mattress when you try to roll over or get out of bed. This can become rather uncomfortable, especially if you are an active sleeper who turns over multiple times during the night. I found that the molecule mattress responded fairly quickly whenever I changed positions while laying down. In order to demonstrate the recovery rate of this mattress, I pressed down on it several times and created the video above so that you can see how quickly it recovers. Motion isolation is something that you will want to consider if you are sleeping with a partner who is active in their sleep. Motion isolation or motion transfer refers to how well the mattress can localize or absorb one’s movement. A bed partner that moves around a lot at night will prevent you from getting a rejuvenating night of rest. The slightest movement caused by your partner can prevent you from falling into a deep sleep which means you may wake up feeling less than refreshed. Fortunately, most foam mattresses are very effective when it comes to isolating motion. Compared to coil mattresses, foam mattresses such as the Molecule are superior. The motion isolation test involves a wine glass that’s filled with water, a vibration meter app, and a 14lb weight that’s dropped from the opposite side of the bed from a distance of one foot. This test is repeated three times. The above video shows the motion transfer test in action. 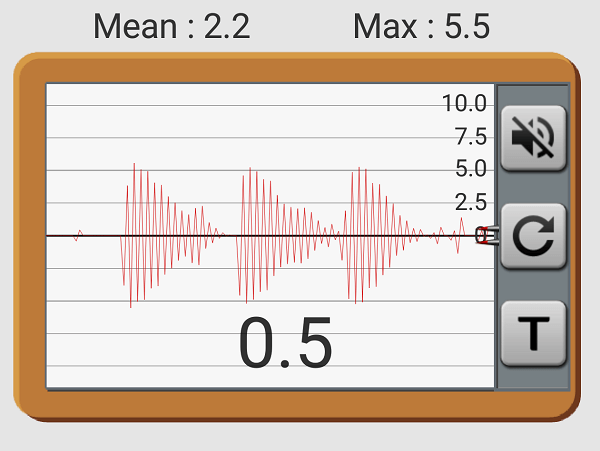 As you can see, the glass moved very little and the vibration meter showed a low mean reading of 2.2 MMI and a max rating of 5.5 MMI. It’s safe to say that this mattress performed very well in the motion isolation test. When laying on a mattress, you’ll want to choose one that can hold your body weight even when laying close to the edge. Cheaper foam mattresses that contain low-density foam have a tendency to collapse when you lay close to the edge. If you are sharing your bed with a partner, this is something that you should consider as every square inch of your mattress should be usable. When laying on the Molecule, I was able to roll all the way to the edge without experiencing the feeling of being ejected from the bed. Some mattresses will literally toss you onto the floor if you get too close to the edge. With the Molecule, this was not an issue. For an even cooler sleeping bed, Molecule recommends using their sheet set along with their bed. Molecule sheets are not your standard cotton sheet set. They are made from a blend of 48% TENCEL Lyocell fibers and 52% cotton. This fabric is designed to keep your body cool and provide a silk-like sleeping surface. The key feature is the TENCLE fibers which has moisture-wicking properties. You can purchase the sheet set in any size and in the colors Ivory, Powder Blue, Cloud Gray, or White for $199 (queen size). These sheets also come with a 60-night sleep trial, which allows you to return them if you are not satisfied and receive a full refund. I experienced sleeping on the Molecule sheet set and found them to be super-soft, silky and cool. They had a very luxurious look and feel and appeared to be a high-quality product. While I used these sheets on my Molecule bed, I also tested them on another foam mattress and found that they also performed well, keeping my bed cool and dry. The 15″ deep sheets fitted nicely over my 12″ Molecule mattress and remained in place throughout the night. While a little bit pricey, these sheets are well worth it and will give your mattress a deluxe, high-end feel. Molecule was launched in early 2018 and is headed by Albert Oh and Co-founder Raymond Lyle. Their website doesn’t offer any additional information regarding how the company was created. While Molecule has only been around for a short period of time, they have amassed a rather impressive list of sleep scientists and athletes who are brand ambassadors. Athletes such as quarterback Russel Wilson, rower and gold medalist, Susan Francia, and marathon runner Ryan Hall are among the many who have positive things to say about this mattress. Neurologist Dr. Daniel Barone and clinical psychologist Dr. Michael Breus both agree that the cooling properties offered by Molecule are ideal for promoting restful sleep. Molecule is assembled in the United States from 100% polyurethane foam. In total, it’s 12″ thick and contains three different layers of foams wrapped in a moisture-wicking cover. Each component of this mattress serves a unique purpose. The foam used in this mattress is created using the Variable Pressure Foaming (VPF) process which is the most eco-friendly way to produce foam. VPF foams are produced in an enclosed chamber and harmful blowing agents are not used. The bottom layer, or base layer, is made from a 7″ thick slab of high-density foam with a rating of 1.5 lbs and an IFD of 35lbs. Molecule calls it their “ContourFlo” layer. The density of a mattress refers to the weight of one cubic foot of foam. This is simply the number of pounds a 1’x’1×1′ sample of foam weighs. IFD is an acronym for Indentation Force Deflection. This is the number of pounds of force that it would take to compress a piece of foam by 25% using an 8.25″ disk. The higher the IFD, the firmer the foam. Base foams often have a higher IFD rating. A firm foundation is necessary as it helps to provide proper support and body alignment. Without it, your body will sink down into the mattress and you will receive no support. The transition layer, or middle layer, contains a unique 2″ thick hexagon-shaped foam material that is said to promote airflow. Molecule calls it their “RecoveryFlo” layer. It has a density of 1.65 lbs and an IFD rating of 23 lbs which is slightly more dense than the base layer, yet has a softer feel due to the lower IFD rating. The transition layer acts as an in-between layer that joins together the base with the top while helping to move trapped heat from within the mattress. The comfort layer is simply the top layer of the mattress and is what you feel when you initially lay down on it. 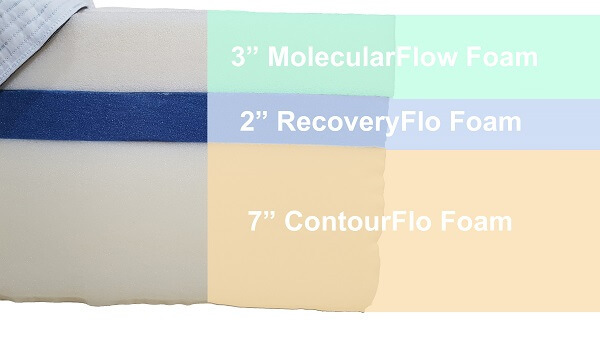 They call this their “MolecularFlo” layer and it’s their proprietary foam which is said to deliver seven times the airflow of traditional memory foam and twice the amount of other manufacturers’. This is a 3″ thick slab of foam with a density of 3lbs and an IFD rating between 7-9 lbs. It’s made from an open-cell foam which is more breathable than traditional memory foam which means that it’s going to cool better. 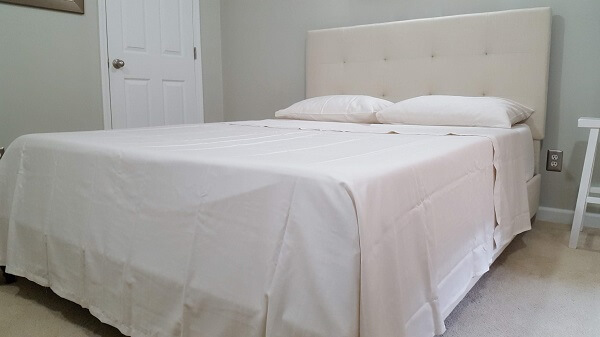 To complete their mattress, Molecule uses an “advanced cover” with an applied Microban antimicrobial treatment which helps to destroy bacteria and keep the mattress smelling fresh. The cover is made from 99% polyester and 1% Elastane. This material quickly responds to body temperature by wicking sweat away, allowing it to evaporate which keeps the mattress cool and comfortable. 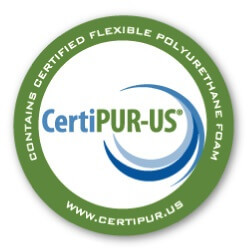 CertiPUR-US is a not-for-profit organization that tests and certifies foams that are used to make a number of products, including mattresses. It’s important to keep in mind that not all foams are created equally. Some are produced overseas where there’s often little to no oversight. These foams can make their way into the US and into the homes of unsuspecting consumers. They can contain harmful elements such as mercury, lead, heavy metals, formaldehyde, ozone depleters, and high levels of Volatile Organic Compounds (VOCs). Manufacturers can choose to participate in the CertiPUR-US program by having their foam tested to ensure that it does not contain any chemicals that are deemed unsafe. The CertiPUR-US website offers a list of participating companies. I was able to locate Molecule as it was shown as currently being certified. Some mattress manufacturers offer multiple comfort levels while others only offer one. Molecule sells their mattress in only one comfort level which is a medium firm. They describe as a 6.5 on a scale from 1-10. For most sleepers, a medium firm mattress will be comfortable, although there are some that prefer a softer or firmer mattress. If you happen to fall on the far end of either spectrum, the Molecule may not be a good choice for you. Molecule offers a limited lifetime warranty which exceeds the 10-year warranty that’s offered by the majority of mattress companies. As with all other mattress warranties, there are limitations that should be considered. The warranty is non-transferrable and covers material defects and issues with workmanship. Molecule’s warranty covers sagging greater than 1″ as well as malfunctioning zippers and flaws in cover construction. The terms of this warranty are similar to what nearly every mattress manufacturer offers. The length of the warranty is, however, exceptional. Molecule is offered in six different sizes including twin, twin xl, full, queen, king, and California king. The price that you pay will vary depending on which size you choose. You should expect to pay between $899 and $1,399 for a Molecule mattress. The good news is they offer free shipping. 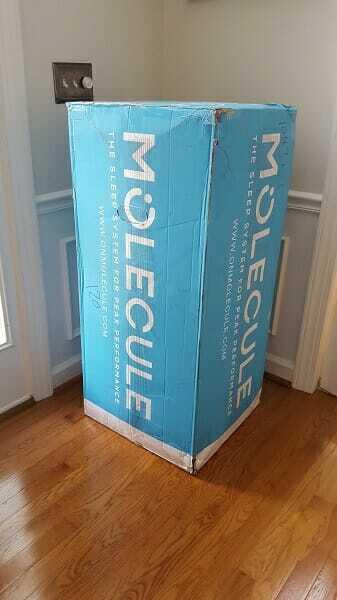 Molecule ships their mattresses using FedEx which has a transit time of one week or less. Pricewise, I would consider this mattress to be average in comparison to similar foam mattresses. Molecule is currently running a promotional offer where you are able to receive 0% APR financing for either 12 or 18 months, depending on which mattress you purchase. Their financing is offered through Klarna credit and is subject to credit approval. The chart below shows the total cost as well as monthly payment if you decide to finance. For most of us, buying a mattress online is uncharted territory. It can be difficult to spend such a large amount of money without ever laying on a mattress to try it out. Online mattress companies know this which is why nearly all of them offer a free trial where you are able to try out a mattress in your home for a specified number of nights and return it if you are not satisfied. Molecule offers a 100-night trial where you are able to try out their mattress to see if it’s a good fit. Their risk-free trial allows you to receive a full refund if you are not satisfied with your mattress. Simply contact them and request a refund. They will arrange for a pickup and issue you a full refund. Molecule has several great selling points which differentiate it from many of the others out there. First, this 12″ mattress does sleep cool and is very comfortable. There are a number of foam mattresses out there that trap heat, causing you to overheat. The Molecule, however, is not one of them. It’s MolecularFlo and RecoveryFlo foam material really helps the mattress breathe. The sheets also seem to help keep you cool and dry throughout the night. This mattress also performed well in the motion isolation test, which is important if you share your bed with a partner. Even the slightest movement can unknowingly keep you up at night. Molecule does have you covered here. 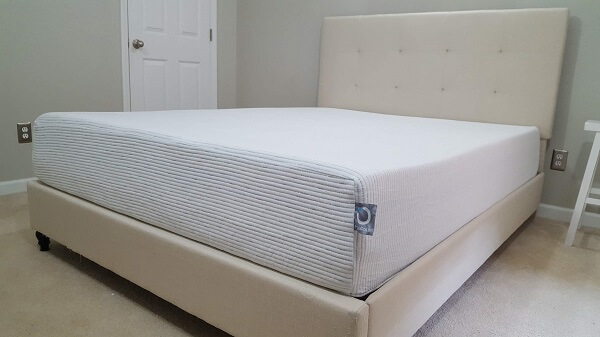 Molecule comes with a limited lifetime warranty, which is much longer than the standard 10-year warranty that’s offered by most mattress manufacturers. The terms of their warranty seem to be identical to most. This mattress is offered with a 100-night trial, which allows you to receive a full refund if not satisfied. Finally, Molecule is CertiPUR-US certified meaning that you can be assured that the mattress is safe and doesn’t contain any harmful chemicals. Molecule is reasonably priced and has a lot to offer. Not being an athlete, I can’t vouch for the performance-enhancing claim, although I can say that I did sleep well and woke up feeling refreshed each morning that I slept on it. Overall, this is one mattress that I would highly recommend. Next post: Morphiis Mattress Review – Is This Bed A Game Changer?